Two women are thinking inside the box when it comes to innovative housing solutions. Kathy Ratchford and Alison Lawtey have both repurposed steel shipping containers for residential purposes. Ratchford, founder of Caledon company Contained Living, has created a 310-square-foot home from two, used eight-by-20-foot containers for the Toronto Fall Home Show, running Sept. 28 to 30 at the Enercare Centre, to illustrate how container housing can be functional, sustainable and affordable. In Prince Edward Co., Lawtey is using four, nine-by-20-foot steel cargo boxes to create unique B&B lodging. Three containers serve as guest bedrooms while the fourth is a common kitchen and lounge. Her home show creation will see one container dedicated to a living room/bedroom combination space, with the second housing the kitchen and bathroom. The kitchen will have full-sized appliances, the washroom is four-piece, and there’s stackable washer and dryer. The bedroom will feature a queen-sized Murphy bed. Its corrugated steel exterior is painted dark grey, and the dents it received during life on the sea still evident. Inside, the design is clean and contemporary, with a grey palette and modern finishes. It includes on-demand hot water and in-floor radiant heating. Tesla installer Signature Electric has equipped it with an electric vehicle charger and Great Northern Insulation and BASF are using the house to showcase insulation products. Lawtey, who grew up in Toronto’s Guildwood neighbourhood, moved in April, 2017 to Prince Edward Co. with a plan to start a bed and breakfast business. She turned to Storstac, an Etobicoke company that sources and modifies shipping containers, and was referred to designer Jason Halter of Wonder Inc. As township zoning allowed only one new out-building, Lawter’s three-container plan was reimagined by Halter and colleague Javid Jah as a four-container build, joined by sliding barn doors, to create a continual wall when closed, centred around an interior courtyard. Each of the three guest suites has a three-piece bathroom, individual heating and cooling, spray-foam insulation, queen-sized bed and views of surrounding fields. The interior design is Scandinavian-inspired. The containers’ exteriors have been painted charcoal grey with marine-grade paint and Storstac welded the container doors to serve as roofs over private cedar decks. Storstac did the initial fabrication and local contractor Dave Turnbull of Structural Technology has taken over since the containers arrived on site on June 18. Lawtey’s B&B is slated to open in October. Ratchford and Lawtey acknowledge that shipping container builds aren’t as inexpensive as people may think. 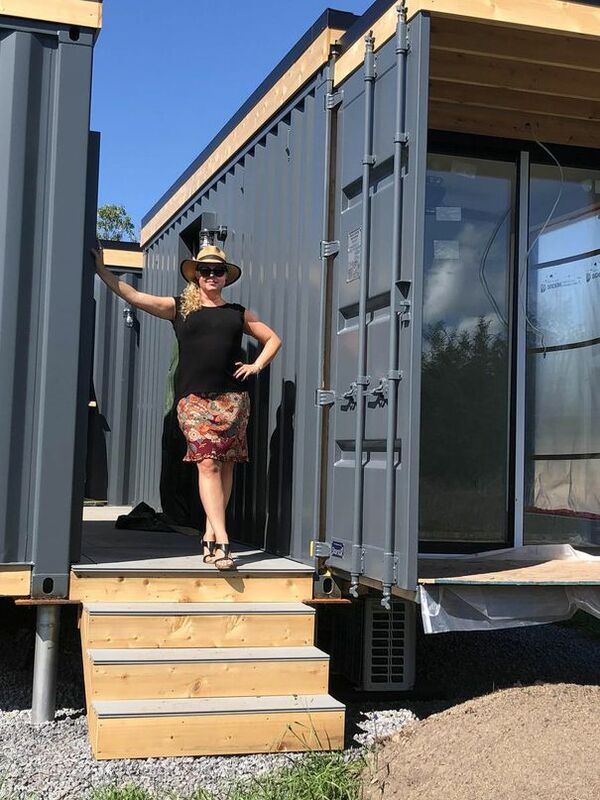 Lawtey estimated her project would cost $200,000; with the addition of the fourth container with kitchen and lounge, the total cost is close to $325,000. But, she figures the added facilities will create more value for guests and pay off for her business. Container costs can vary. “One way” containers that have travelled once across the ocean are more costly than well-used ones. Tall containers are more than those with standard eight-foot heights. Ratchford paid $1,500 each for her containers from Dobson’s in Palmerston but says prices have doubled this year. Shipping container homes must meet the Ontario Building Code and require foundation, insulation, wiring, heating and plumbing, plus the expertise of a welder/fabricator. Transportation costs to a site can also be costly.